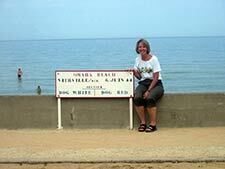 Omaha Beach was the code name of the Normandy Beach which was of crucial importance to capture on D-Day, June 6, 1944. The Allies landed 34,250 people from the U.S. 29th and 1st Infantry Divisions on Omaha Beach on D-Day and it is estimated that there were 2000 casualties. Many of the soldiers drowned between their ships and the shore and others were killed by Germans who were defending their positions from above the beach. 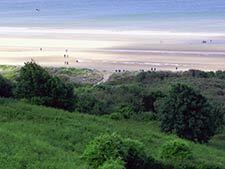 Omaha Beach became known as “Bloody Omaha” because of the losses suffered that day. Omaha Beach is the second beach from the west among the five landing areas of the Normandy Invasion of World War II (from the west, the beaches are Utah, Omaha, Gold, Sword, and Juno). The area provided gaps in an otherwise limestone cliff terrain, so was considered accessible from the shore. However, this also made the area easy to defend for the Germans and they had strategically erected antitank walls and many minefields, machine-gun nests, mortars, and horrid barbed wire. Everything the Germans had learned in World War I about how to stop a frontal assault by infantry Rommel put to work at Omaha. The Climatic Battle of World World II. At the present time, it is still too early to say whether this is a large-scale diversionary attack or the main effort.